The AquaCera W9510300 CeraSyl is a ceramic water filter. It is manufactured to removed suspended solids, pathogenic bacteria and cysts from your drinking water. The W9510300 is silver impregnated to prevent bacteria growth and is self-sterilizing. Cleanable. The AquaCera W9510300 CeraSyl Ceramic Water Filter features a cleanable filter element. 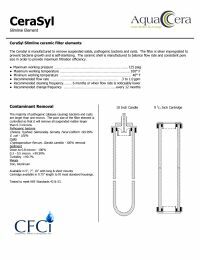 CeraSyl Slimline Element The CeraSyl 10" Ceramic Water Filter has been tested to meet NSF Standards 42 & 53. Contaminant Removal. This filter removes suspended solids, cysts and pathogenic bacteria while featuring a 100% filtration efficiency level at 0.8 microns. Additional Efficiency. The AquaCera W9510300 also has an efficiency level of >99.99% when dealing with micron ratings of 0.3 to 0.5.This CeraSyl candle has an extremely high bacteriological filtration efficiency which is >99.99%.